The brain is part of the central nervous system. The brain is located in the cranial vault and is the site of the higher (cognitive function, senses, nerve responses) and autonomic functions. It is therefore an essential organ which regulates all vital functions. The brain receives information from the whole human body through afferent nerves, incorporates and analyses the information it receives, and then responds by sending out new signals which descend down to the parts of the body concerned along efferent nerves. The brain is responsible for heart and respiratory rate, functions that we do not have under our conscious control. However, it is also involved in decision -making, body motor activity, behaviour, memory, consciousness, etc. The brain has been mapped and some areas appear to be associated with specific functions (speech area…), whereas more complex functions (memory, consciousness) appear to be more widely distributed. The human brain contains approximately 100 million neurones and weighs an average of 1,300 to 1,400 grams. It also contains glial cells and astrocytes. It is bathed in cerebrospinal fluid. The brain is composed of two hemispheres, the right and the left, connected to each other by the corpus callosum that is composed of white matter (myelin sheath axons). The hemispheres are divided into lobes and are the most highly developed parts in mammals. 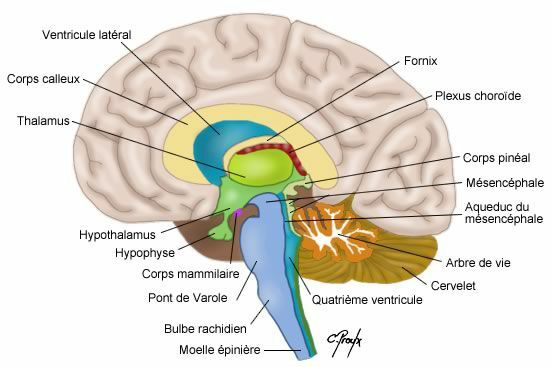 the brain stem (control of reflexes and autonomic movement : respiration, control of heart rate, regulation of arterial smooth muscles) which communicates with the spinal cord. Please refer to our full section for more information about the brain.